There's not much more you can say about a company that has been pulverizing their competition since day one. If you happen to be the one being pulverized, your best bet is, pay attention and attempt to emulate. Most have figured out the speed and torque thing by now. The key is how to reduce noise, stand up to sterilization, and avoid the repair shop. Kavo excels at all three. Noise reduction, due in part to near perfect turbines with balanced impellers, and ceramic bearings in newer models. 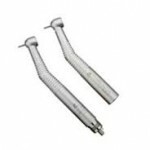 We all know that sterilization remains the nemesis of the modern dental handpiece. Kavo greatly lessens the probability of moisture intrusion with large, sealing o-rings, sealed bearings, and clean fit of turbine in handpiece head. Keeping moisture and chemicals away from turbine components ultimately results in handpiece longevity. At 400,000 RPM, eventual turbine replacement will be necessary. Just not as often as most competitors. Sorry repair guys. The 635B Fiberoptic High-speed Handpiece features a compact turbine head and is designed for a wide range of dental restorative procedures. The 25 LPA 1:5 Speed Increaser converts 20K to 100K RPM with excellent control. The Electrotorque provides a high tech solution to most any application, from 2 to 200,000 RPM. The EWL Series electric lab handpieces offer variety and technical superiority. The 6500 - 57 dB, light weight, sleek design, perfectly angled head. The 8000 - 19 Watts of power and whisper quiet at 57 dB. The success of Quattrocare is due, in large part, to the proprietary foam solution. 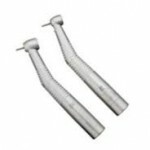 The CDC recommends sterilizing handpieces at a minimum of 275 degrees F for at least 18 minutes. 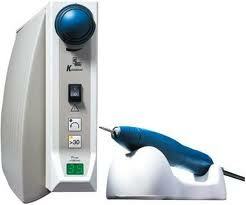 This is not a problem for any Kavo handpiece made to withstand the autoclave. 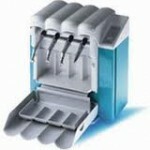 Kavo QuattroCare users have learned also that the complete purge and cleaning offered by this unit increases the handpiece's resistance, by removing particulates which can be baked on to the interior.